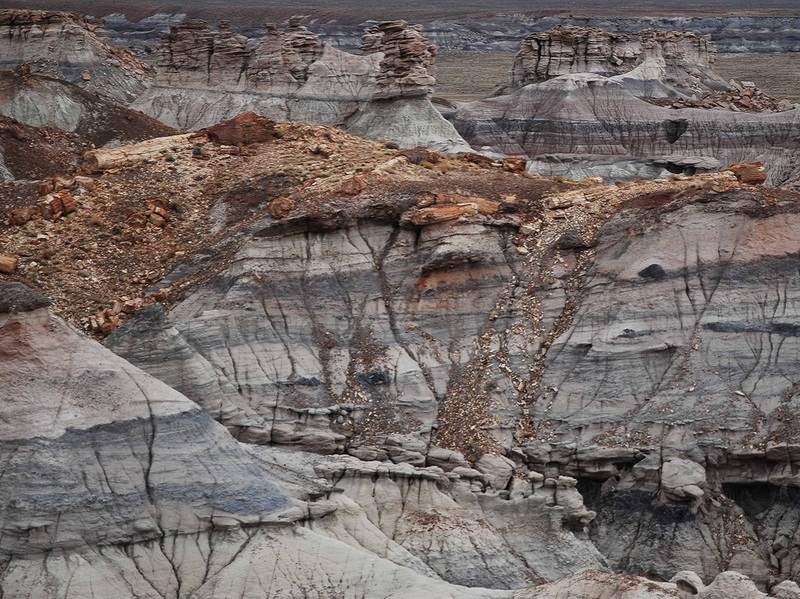 This photo reveals an exposure of the Upper Chinle Formation at the Painted Desert National Park. 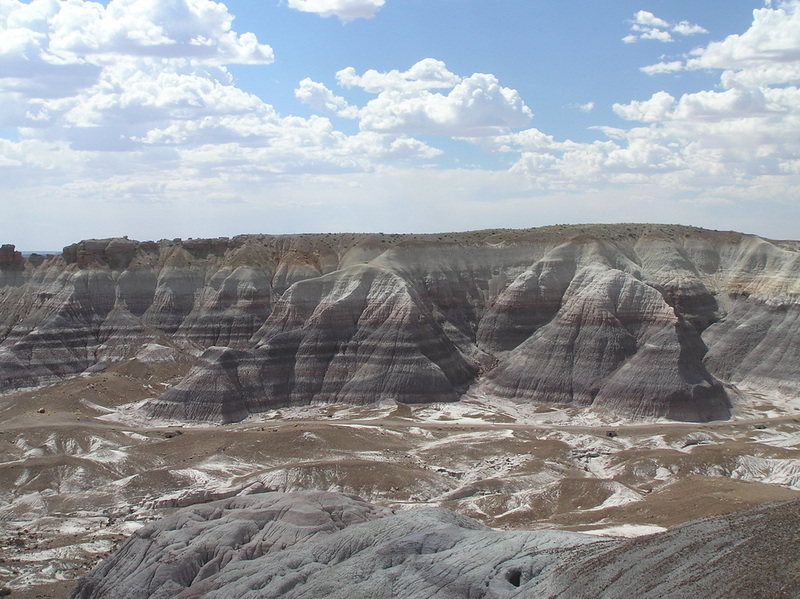 The clayey/sandy/ash matrix of the formation covers much of the Southwest United States, an estimated 150,000 sq. mi., and is thought to be contiguous with strata in the eastern United States and other continents. 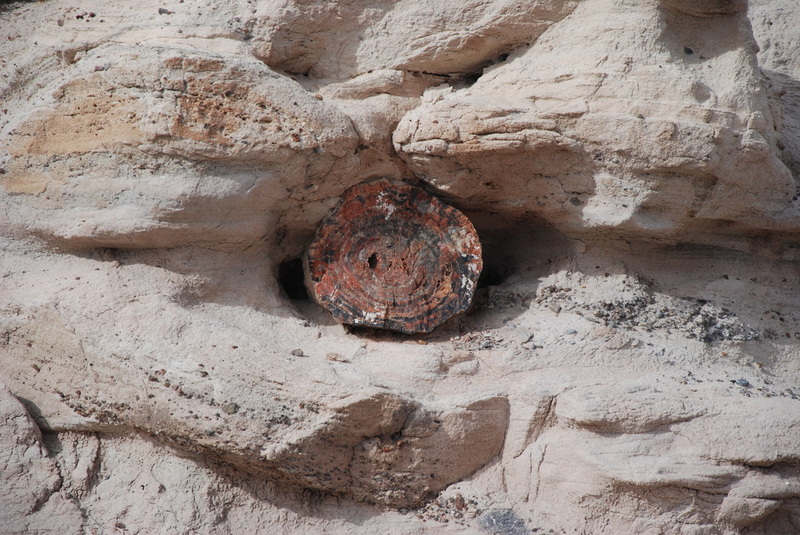 It has plant and animal fossil forms scattered throughout its layers. 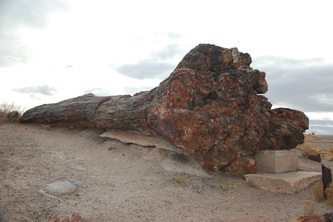 Fossil trees are found jumbled together and on top of one another, parallel to each other, and some are even upright with the root bulb down but no or limited roots extending from the bulb. Some trunks transect two or more strata, and one intact trunk (without branches or roots) is up to 90 feet long. Dinosaurs are found in a few layers crushed among water born life such as mollusks. 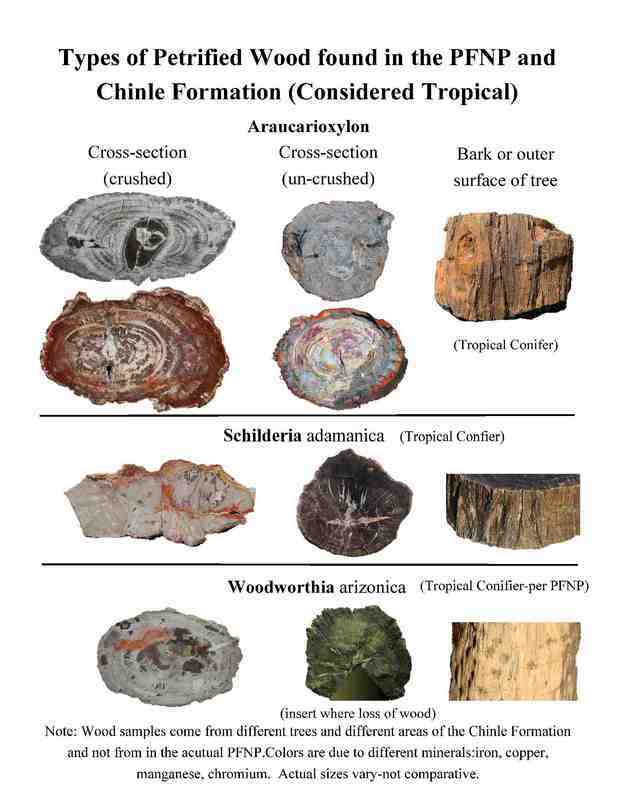 A creationist geologist gave me the following comments," The Chinle Formation" (including the Upper and Lower Chinle/Shinarump sections) "is full of clays derived from volcanic ash, which is why the strata have the varied bright colors they do. 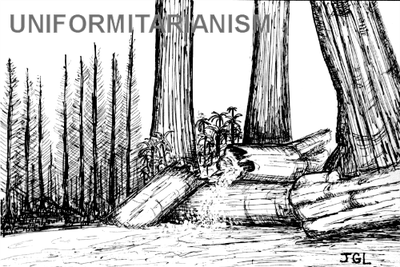 So violent volcanic eruptions were involved, along with flooding to deposit the layers and entomb the logs. And the high silica content of the sediment layers plus the hot water interstitial in the sediments aided rapid petrification of the wood to fossilize it with such brilliant colors." 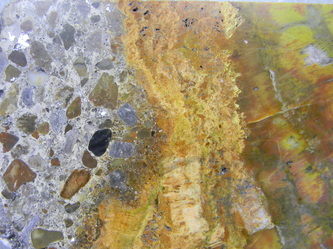 The Shinarump is a thin gravel lens that spreads across much of the formation.The deposition of it is most consistent with rapid water flow. 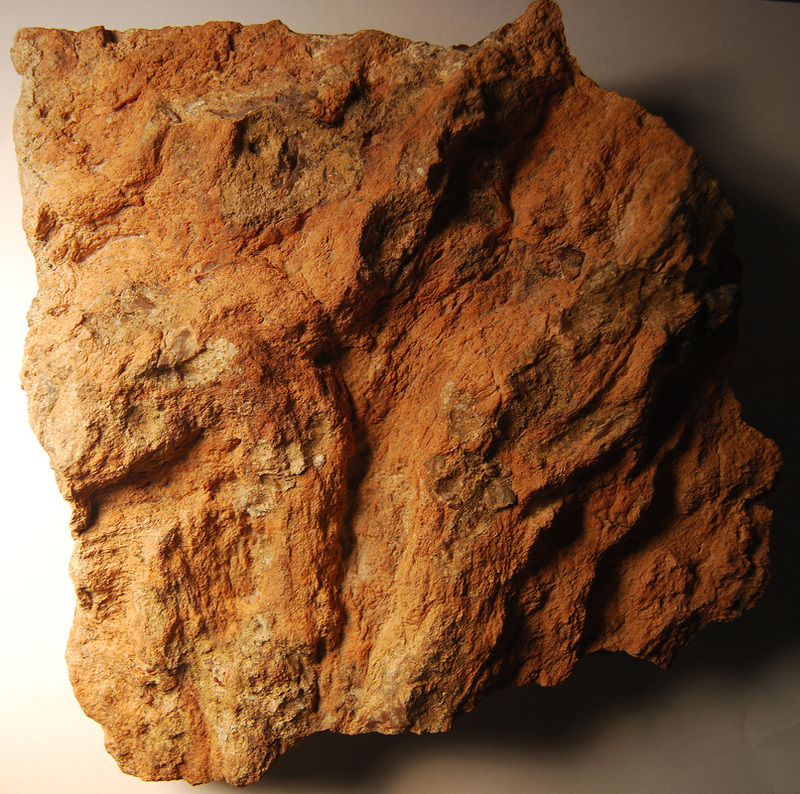 As well large reptiles such as the Aetosaur, Phytosaur, Placerious and Postosucuhus; amphibians such as the Metoposaurus group, along with many forms of plant life, the Unioid (and other) clams, and large fish have been found in these strata. The living members of the Unioid clam group are observed to live mainly in fresh water. (As well, please see article below regarding "Living Fossils" below.) It is unlikely in the Biblical Flood scenario that there would have been as much salty water prior to the Flood. So fresh water clams (if they were then) would be expected. 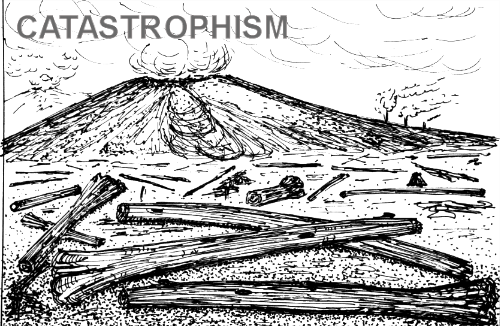 All of these observations can be consistent with massive sequential laying down of water born muddy and ash(volcanic) ladden matter over large areas probably in an ebbing and flowing action; and with the rapid burial of plant and animal life. While this is conjecture, it is just as valid as other views. 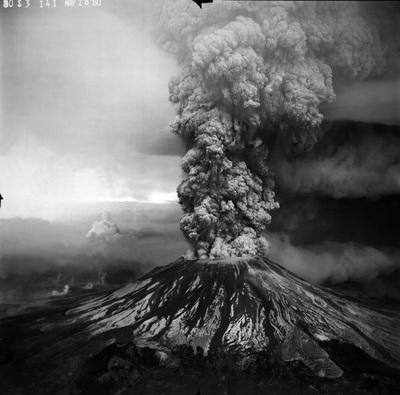 Evidence from the Mt St Helen's recent volcanic eruptions support this view. See the last 4 pictures in series. (Also see section on Religion, Philosophy, and Science section for an explanation.) These observations would be consistent with the Noah Flood Account (see dissertation on this website). The Mt St Helen's event represents a local observed catastrophic event. 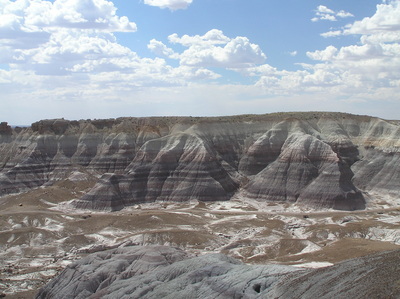 The Chinle/Shinarump strata at the Painted Desert/Petrified Forest and other similar strata elsewhere probably represents a continental and even a trans-continental catastrophic event. FOR THE PICTURES BELOW CLICK ON THEM FOR AN EXPLANATION. The Painted Desert of northern Arizona is noted for its' beauty. Yet, it is also a tremendous area for evidence of a massive flood consistent with that of Noah's Flood. 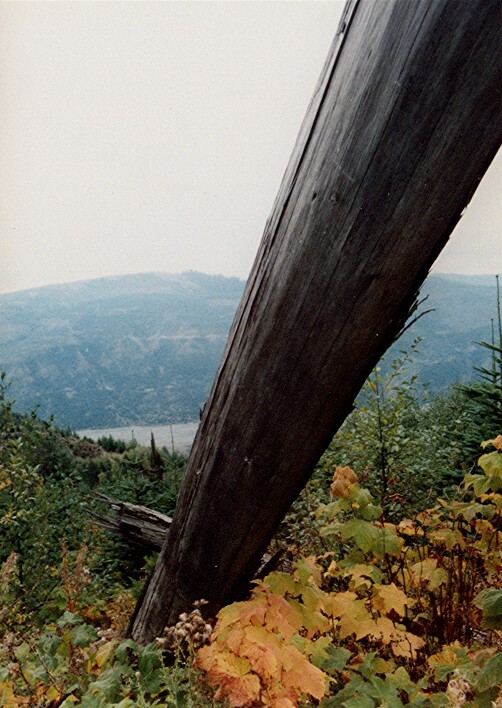 This file contains a field guide for a tour through the Park and gives examples consistent with flood deposition. 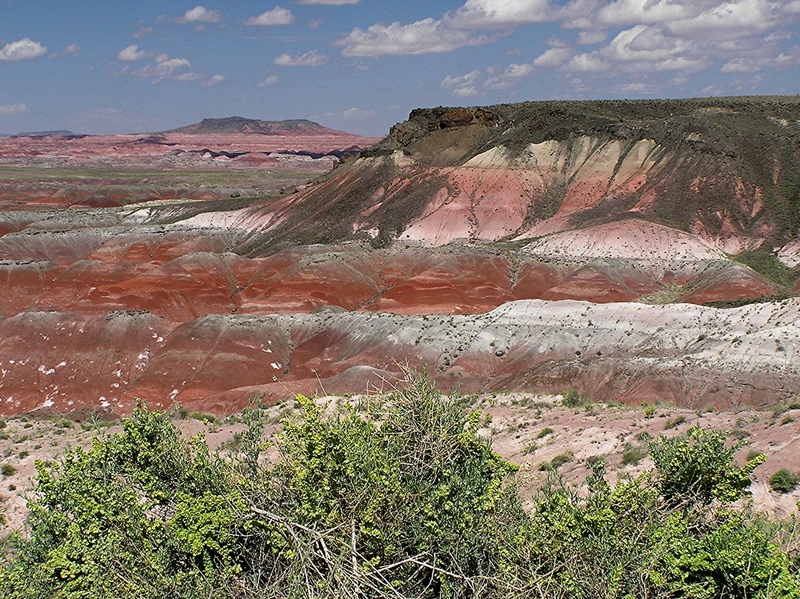 Least anyone attempt to state that this is evidence for a local flood, the Painted Desert strata cover vast areas in the Southwestern United States, and is similar to strata in the Eastern United States. As well, there is similar strata in Germany (the Keuper Formation).This tour guide is copyright but copy for personal non-profit use is allowed. Please note that these are considered tropical conifers but are now found in a northern desert wasteland. As well, they are found crushed and tumbled together which is consistent with flood deposition and not meandering streams in a forest such as is proposed by the Petrified Forest National Park (PFNP). See book sectionI will be producing a book on this area in the near future. 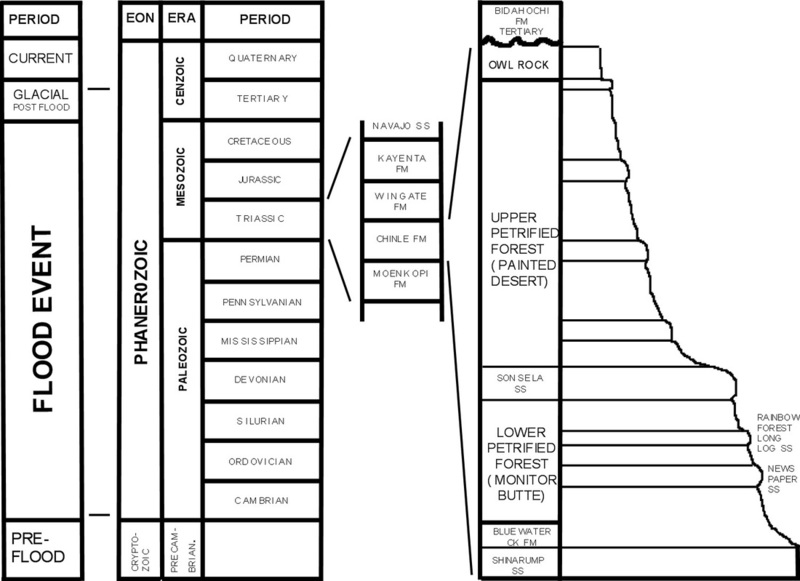 ﻿Six Evidences for the Genesis Flood by Dr Andrew Snelling (geologist) 9/17/07. Reprinted with permission. 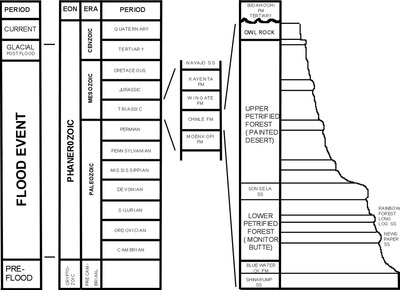 "Evidence #1—Fossils of sea creatures high above sea level due to the ocean waters having flooded over the continents. 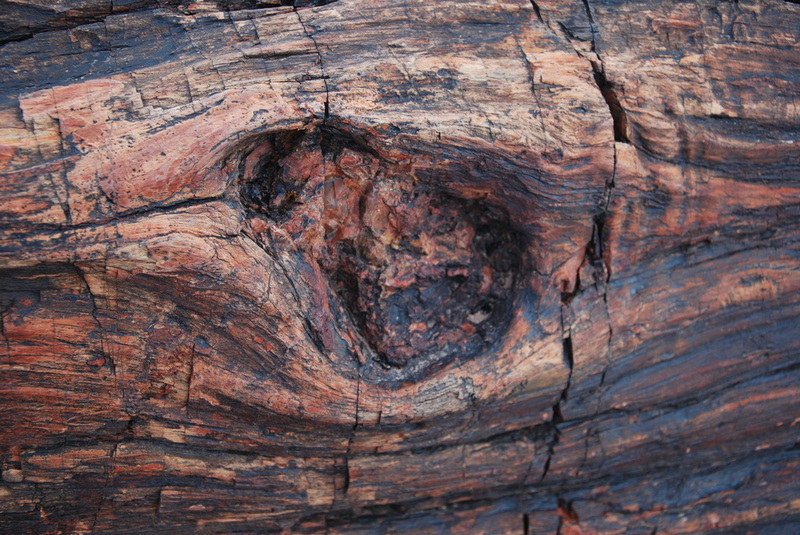 We find extensive fossil 'graveyards' and exquisitely preserved fossils. For example, billions of nautiloid fossils are found in a layer within the Redwall Limestone of Grand Canyon. This layer was deposited catastrophically by a massive flow of sediment (mostly lime sand). 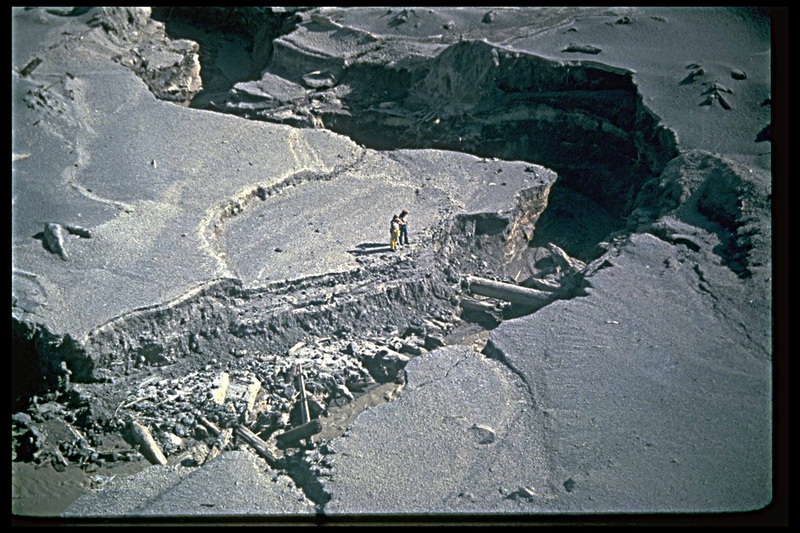 The chalk and coal beds of Europe and the United States, and the fish, ichthyosaurs, insects, and other fossils all around the world, testify of catastrophic destruction and burial. 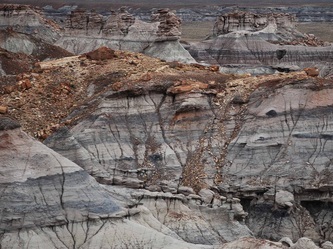 We find that the sediments in those widespread, rapidly deposited rock layers had to be eroded from distant sources and carried long distances by fast-moving water. 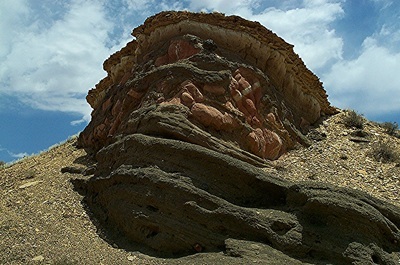 For example, the sand for the Coconino Sandstone of Grand Canyon (Arizona) had to be eroded and transported from the northern portion of what is now the United States and Canada. Furthermore, water current indicators (such as ripple marks) preserved in rock layers show that for '300 million years' water currents were consistently flowing from northeast to southwest across all of North and South America, which, of course, is only possible over weeks during a global flood. 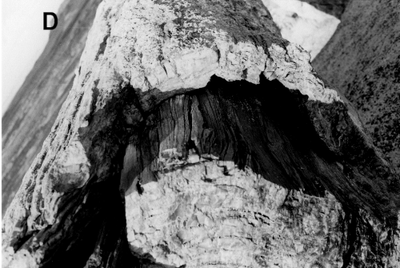 Rocks do not normally bend; they break because they are hard and brittle. But in many places we find whole sequences of strata that were bent without fracturing, indicating that all the rock layers were rapidly deposited and folded while still wet and pliable before final hardening. 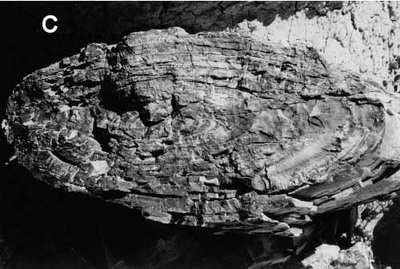 For example, the Tapeats Sandstone in Grand Canyon is folded at a right angle (90°) without evidence of breaking. Yet this folding could only have occurred after the rest of the layers had been deposited, supposedly over '480 million years,' while the Tapeats Sandstone remained wet and pliable. Jesus Christ our Creator (John 1:1–3; Colossians 1:16–17), who is the Truth and would never tell us a lie, said that during the 'days of Noah' (Matthew 24:37; Luke 17:26–27) 'Noah entered the Ark' and 'the Flood came and took them all away' (Matthew 24:38–39). He spoke of these events as real, literal history, describing a global Flood that destroyed all land life not on the Ark. Therefore, we must believe what Christ told us, rather than the ideas of fallible scientists who weren’t there to see what happened in the earth’s past. Thus we shouldn’t be surprised when the geologic evidence in God’s world (rightly understood by asking the right questions) agrees exactly with God’s Word, affirmed by Jesus Christ. The next article in this geology series will look in detail at the geologic evidence that the ocean waters flooded over the continents, just as described in Genesis 7–8." "* I want to acknowledge that these geologic evidences have been elaborated on by my colleague Dr. Steve Austin at the Institute for Creation Research in his book Grand Canyon: Monument to Catastrophe, pages 51–52 (Institute for Creation Research, Santee, California, 1994)." There are six sections to the series and this is part of the initial page. ﻿These further sections can be accessed at ﻿below link. As well, see the link below it to see examples of "Living Fossils" on this website. "One of the main reasons that people trained in the sciences today ignore the account in the Torah of a recent global Flood cataclysm is that they are persuaded that the standard geological timescale is in large measure correct. 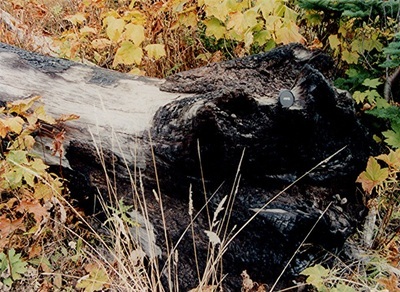 This paper reviews research that shows that the key assumption underpinning that timescale, namely, the time invariance of nuclear decay processes is false... "
This link has a number of articles on radiometric dating and the problem with absolute dating..